Faced with growing evidence of malfeasance in intercountry adoptions in Uganda, this FSO decided on a course of constructive dissent to correct the problem. Shortly before I left for Uganda in 2015, a good friend adopted a girl from South Asia. My friend was filled with a host of emotions: She was overjoyed by the prospect of welcoming a child into her life; exhausted by the amount of time and energy spent on the process; and nervous that amid the mountain of documents, background checks and legal proceedings, she might have missed one crucial detail that could derail the entire adoption. Nevertheless, she eagerly anticipated the arrival of her newly adopted daughter. We threw her a baby shower, helped her set up and decorate her daughter’s bedroom, and discussed plans for the child’s new life in the United States. When that day finally arrived, all my friend’s doubts and worries were washed away, replaced by the overwhelming joy of becoming a parent for the first time. This is likely the experience most people expect to have when they adopt internationally—and for most, the process, while lengthy, culminates with a profound sense of emotional fulfillment. As many of my consular colleagues can attest, seeing an international adoption through to a successful end is a uniquely rewarding experience. It was an experience I looked forward to having when I arrived in Uganda as the embassy’s consular chief. Instead, I discovered that the rosy picture many have in their minds about international adoption is not always realistic. I worked on hundreds of adoption cases in Uganda, and I found the system to be rife with fraud, corruption and unethical behavior. I saw many well-intentioned U.S. citizens and Ugandans being deceived by conniving middlemen. I saw children who were separated from their families and their country because unscrupulous outsiders saw an opportunity to make money by dividing the family. At the same time, I saw some of my own colleagues turn a blind eye to such abuses, despite the fact that our mandate is to help orphaned children find the care, security and love a permanent family can provide. In short, our policy with respect to intercountry adoptions was not meeting this directive, and that is why, ultimately, I made the difficult decision to formally dissent. I arrived in Uganda with a generally positive view of the process of adoption. But I was aware of certain problems in the country, and as I began reviewing more and more case files, I could not ignore the growing number of discrepancies my investigative staff and I uncovered. I discovered that the rosy picture many have in their minds about international adoption is not always realistic. • Evidence that third parties in Uganda were actively recruiting children from their villages to be placed in orphanages or schools (many of them unlicensed) far from their homes. • Testimony from parents and grandparents who said they did not understand the consequences of the papers they had signed, relinquishing their rights over the children being given up for adoption. • Stories from families who thought their children would be returned to them after receiving an education in the United States. • Statements from U.S. citizens who were pressured to hire specific individuals to provide in-country services at exorbitant rates, or to look the other way when government officials were paid to “expedite” the process. • Falsified paperwork and proof that parents who had been reported deceased were alive and well. These were not isolated incidents. We found such evidence every week and every month, in the majority of cases we reviewed. I came to understand that we faced an intercountry adoption process in which intermediaries financially benefited from desperate or insufficiently informed American adopters and vulnerable Ugandans. And I believed that the U.S. government should no longer be a party to such fraud. Like any good Foreign Service officer, I first made my case to Washington by reporting on what we were learning through a series of phone calls, emails and face-to-face visits. Perhaps naive myself, I expected my colleagues to be as shocked as I was by the evidence. But they were not. Washington remained steadfast in its support for continuing adoptions in Uganda, even as all other countries represented in Uganda were ending them. Pressure, direct and indirect, came in from all sides to maintain the status quo. I was given guidance on how to navigate Uganda’s legal system, how to engage the host government and how to handle the stakeholders—including the petitioners, who could be peremptory and extremely demanding. Members of Congress and their staffs called or wrote to inquire about the status of pending cases and to urge expeditious approvals. Adoptive families, I learned, began criticizing me by name on social media—with one such family even surreptitiously taking my photo at the airport when I was headed away for vacation. One incident, in particular, convinced me that working “inside the system” was no longer a viable option. The government of Uganda proved to be an equally disappointing partner in resolving the issue. Few officials work on this matter, and the office charged with overseeing intercountry adoptions has few resources to investigate orphanages or ensure the welfare of children. An estimated 8 percent of all Ugandan children are orphans, but authorities have little capacity to deal effectively with the problems and needs of this vulnerable population. As a result, Uganda’s adoption system is prone to abuse. As I continued to gather evidence and make the case for a review of the adoption process, stress built up—both in my life and in the lives of my consular staff. Working on this issue was all-consuming, exhausting and deeply frustrating, leading to tensions at home with my Foreign Service spouse. One of my local staff members involved in these cases contemplated quitting because of the stress. As a manager, I sometimes lost sight of other important aspects of my consular responsibilities because of the time and energy I was devoting to adoptions. I remained convinced, however, that the work we were doing—and the attention we were bringing to the issue—was vitally important and could not be ignored. As consular officers, we are obligated to uphold and implement the law; and as far as we could tell, many adoptions being sought in Uganda were not entirely legal or ethical. So we had an obligation to keep pursuing this path, regardless of the pressure on us. One incident, in particular, convinced me that working “inside the system” was no longer a viable option. In late 2016, two U.S.-citizen families made the difficult decision to return the Ugandan children they had adopted. These families had made significant emotional and financial investments, traveled to Uganda multiple times to meet the children, and raised funds in their local communities to support their applications and meet the substantial costs of the adoption process. But the joys they had experienced on returning to the United States with their adoptive children quickly turned sour, when they discovered there were loving families in Uganda eagerly seeking the children’s return. The agencies involved in the adoption had purportedly falsified the paperwork to make it appear the children had no family to care for them. The adoptive families were unaware of this fact, and the children themselves were too young to understand that their move to the United States was permanent. The decision to return the children was emotionally devastating for the adoptive parents. After meeting with one of the parents, I knew that the intercountry adoption system in Uganda was fundamentally broken, and our system to safeguard the process was not working. The only solution I saw that could prevent similar tragedies from occurring to other families was to suspend intercountry adoptions—a position the department simply did not support. To save these families, I would have to dissent, formally. In the end, to do the right thing, I had to rely on the facts in front of me, as we all must if we are to do our jobs correctly. Fortunately, I found much-needed support for the recommendation to suspend intercountry adoption in my own front office. At the ambassador’s request, I documented our findings as thoroughly and dispassionately as possible. Ultimately, we dispatched nearly two dozen cables back to Washington laying out our arguments with clear evidence. Because I could express my dissent through regular channels, in particular the comment portions of the cable, I did not have to use the Dissent Channel. And while the department has not yet fully accepted our recommendations, they have taken steps in the right direction. I am comforted by the fact that I stood on principle and made these issues known more widely. What gives me hope is the fact that the State Department has taken some meaningful actions to correct these problems. Earlier this year, State took the unprecedented step of debarring an American adoption agency, one that had been facilitating adoptions worldwide for many years, including in Uganda. This was a true watershed moment in our efforts to eliminate the system’s abuses. Moreover, thanks to stronger fraud warnings, families are more willing to wait out the process as we conduct thorough investigations of each case. Indeed, some families have even withdrawn their adoption petitions after our investigators discovered evidence of fraud. On reflection, what strikes me most about this entire dissent experience is the emotional aspect of the process. As Foreign Service officers, we care deeply about the work we do—whether it is promoting human rights, advocating for environmental protections, or protecting refugees and vulnerable populations. And with such work come strong emotions—especially in the case of adoptions, where you can immediately see the benefits of your actions. It is truly difficult not to become emotionally involved when you know what’s at stake. Therein lies the danger. The entire process is emotionally charged for the adoptive families—from the anticipation of bringing a child into the family, to the financial commitment, to the uncertainties of a long and complex procedure in a foreign country. But it is also an emotional experience for the consular officer overseeing the case. Emotions can cloud judgment, making officers more willing to overlook potential problems. Certainly, the temptation exists to approve an adoption case to fulfill a family’s dreams. When confronted with wrongdoing or malfeasance, a different set of emotions comes into play. Many of us might prefer to confront a flawed policy with either resentment or apathy. But such feelings distort the message and ultimately undermine the legitimacy of a reasoned and constructive dissent. Had I responded emotionally, it is doubtful I could have changed anything about adoptions in Uganda. Still, I found the process of dissent itself emotionally draining. Like others before me, I worried about the ramifications of my actions. Would I have the ambassador’s support? Would Washington block me from future jobs because I openly voiced my criticisms? In the end, to do the right thing, I had to push aside these concerns. I had to rely on the facts in front of me, as we all must if we are to do our jobs correctly. Difficult as it was for me to take this path, I know it was the correct one. The messages of support I received from colleagues around the world are sufficient proof that dissent remains a critical part of our profession, and that we must all have the courage to speak out when the evidence is clear. We may be filled with unfamiliar or contradictory emotions in the course of our lives and professional careers, but we should never let them cloud our judgment in deciding what is right. Wendy Brafman joined the Foreign Service in 2005. 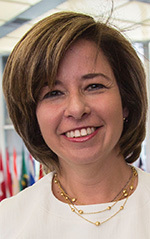 She has served in Kinshasa, Cairo, Baghdad, Kampala and Washington, D.C. Before joining the Foreign Service, she was in private law practice, worked for a nongovernmental rule of law organization in Kosovo and served as a congressional staffer. Ms. Brafman’s husband is also a Foreign Service officer. She received a 2017 William R. Rivkin Award for Constructive Dissent by a Mid-Level Officer.